With a design as sweet as the name implies, the Clementine Collection will be a bright and classic addition for your children’s sanctuary. Scaled for your child’s bedroom, the traditional bed offer a customizable sleep spaces to suit your individual needs. Wooden knob hardware stands boldly against the double bow-fronted case goods while the additional decorative accents of framed bead board paneling and scalloped base carry over to the design of the turned post headboard and footboard - further enhancing the classic look of this lovely bedroom. Also offered for each bed in the collection is a functional trundle allowing for the option of either storage or twin bed. 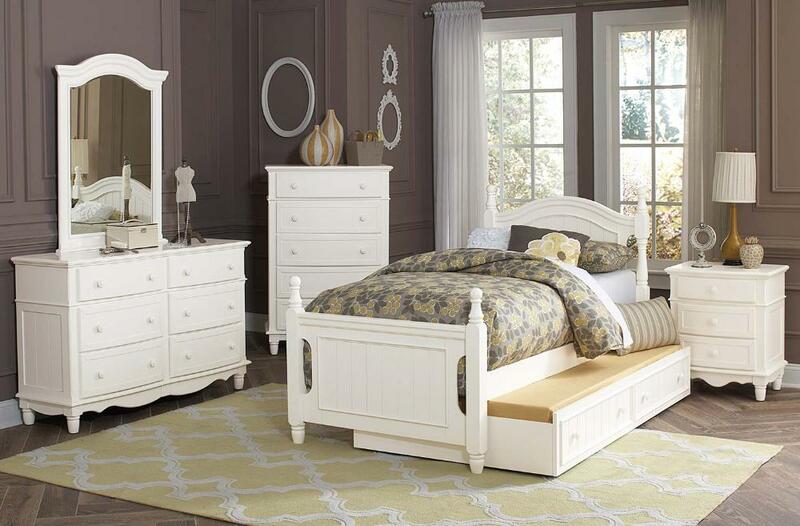 FEATURES: White Finish ~ Traditional Style ~ Decorative Accents ~ Wooden Knob Hardware ~ Dovetailed Drawers ~ Ball Bearing Side Glide.